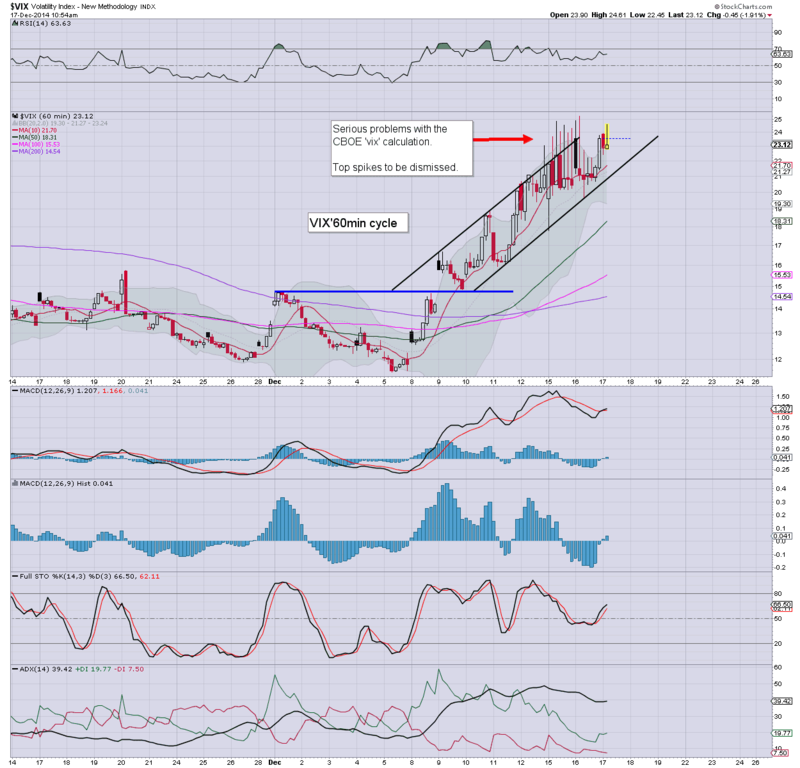 With US equities building gains across the day, the VIX was crushed, settling lower by a severe -17.5% @ 19.44. Near term outlook is for VIX to melt lower into year end.. if not much of January. The low teens, perhaps even VIX 10s are possible if sp'2100s. We have a clear turn in both equities.. and the VIX. The VIX has clearly got stuck in the secondary target zone of 22/25... and with a daily close under the key 20 threshold... there is no doubt now. 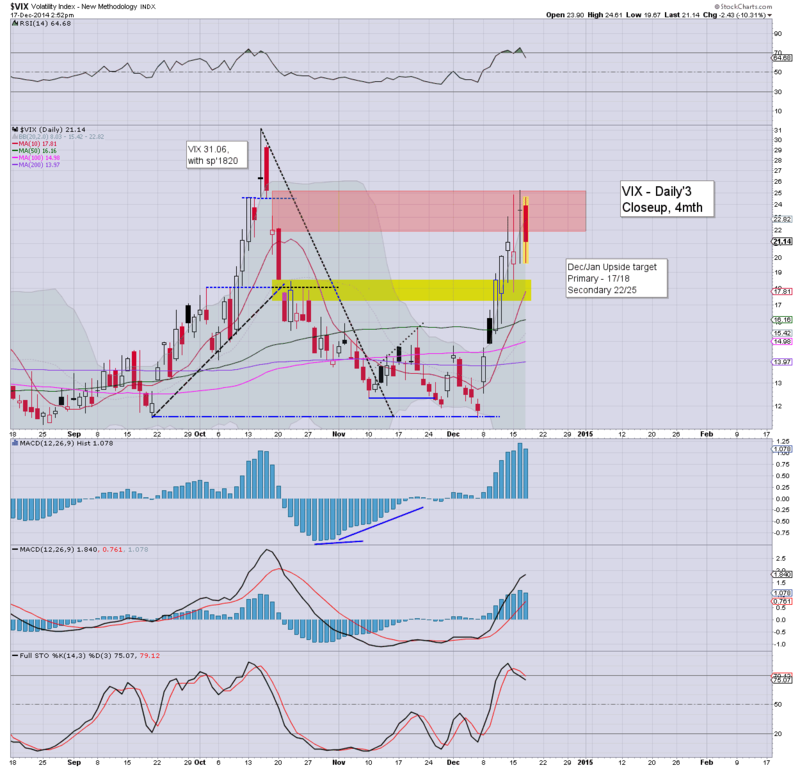 VIX looks set to fall for the rest of the year..... and remain subdued for much of January. 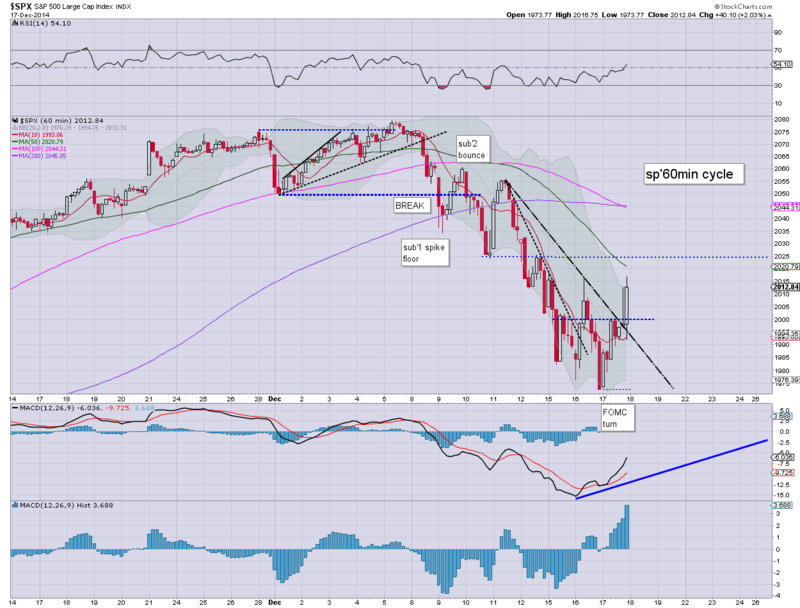 US equities built solid gains across the day, sp +40pts @ 2012. The two leaders - Trans/R2K, settled higher by 0.8% and 3.1% respectively. Outlook is that a key floor of sp'1972 has been put in, with the sp'2100s now due no later than January. With the market holding the early morning gains.. the 1950s quickly became out of range. 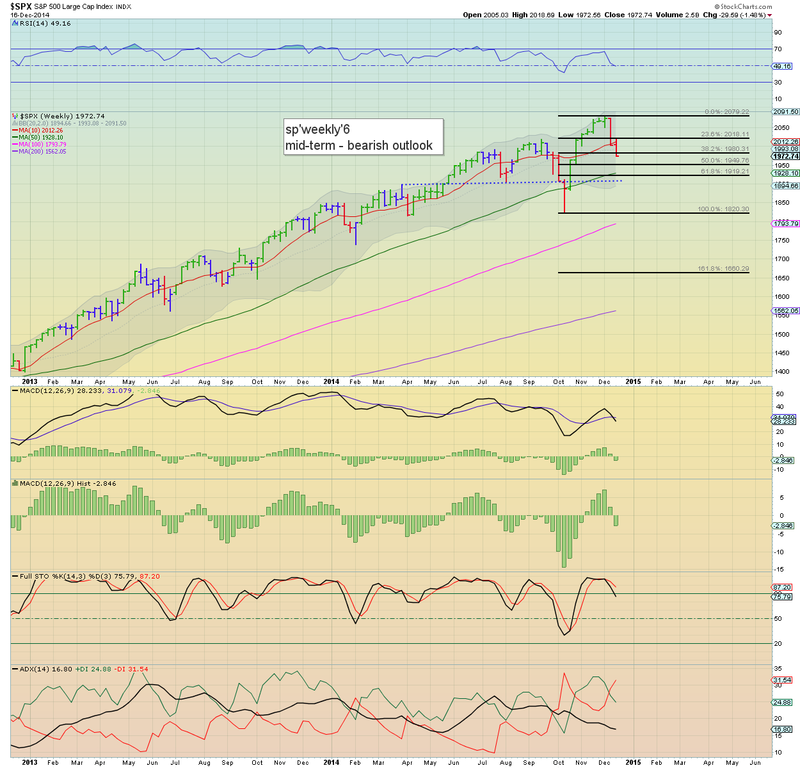 The daily close is EXTREMELY bullish.. and we're now well on the way to the sp'2100s. The real question though.. why would it stop there? I'm increasingly of the view of a straight up run to 2300s by late spring. With Yellen talking about interest rate hikes... the market is a little twitchy, having cooled from sp'2012 to 1997. 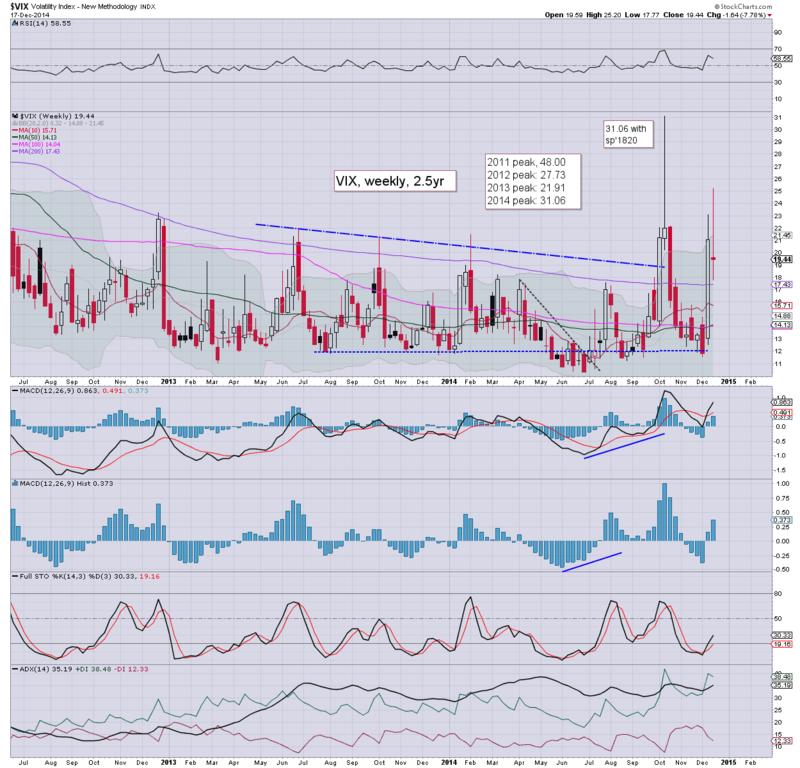 VIX remains cooling though, -9%, having already lost the 20 threshold. Gold remains weak, -$5. Oil is back to flat, having lost earlier powerful gains. The equity gains remain significant.. and right now, the notion of an eventual hit of 1950.. looks completely unrealistic. 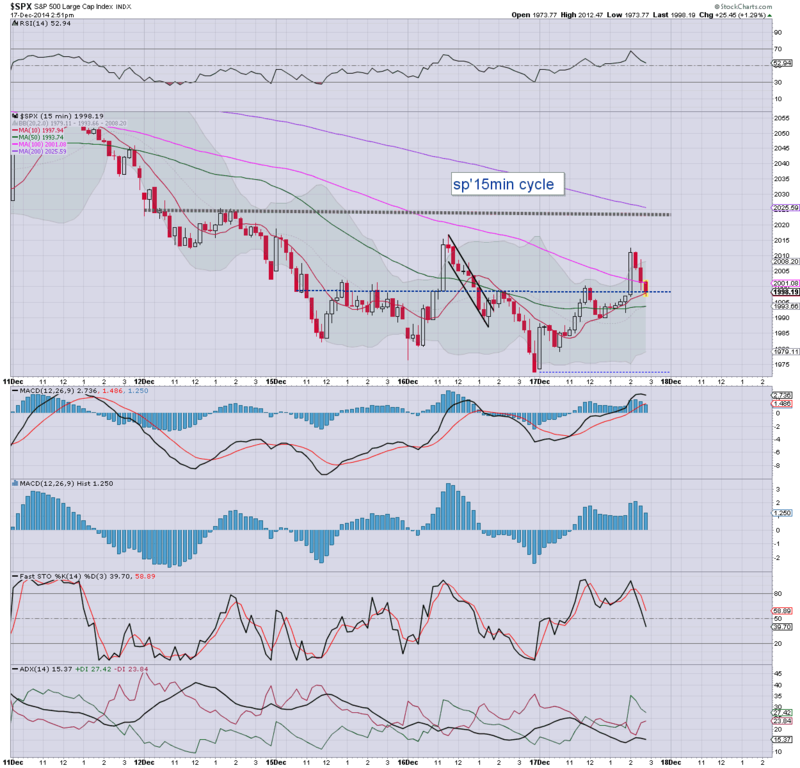 Broader upside still looks underway. 3.07pm... Price action remains broadly choppy... but hey.. we're still net higher... and the bigger weekly cycles will be offering clear turns by the Friday close. 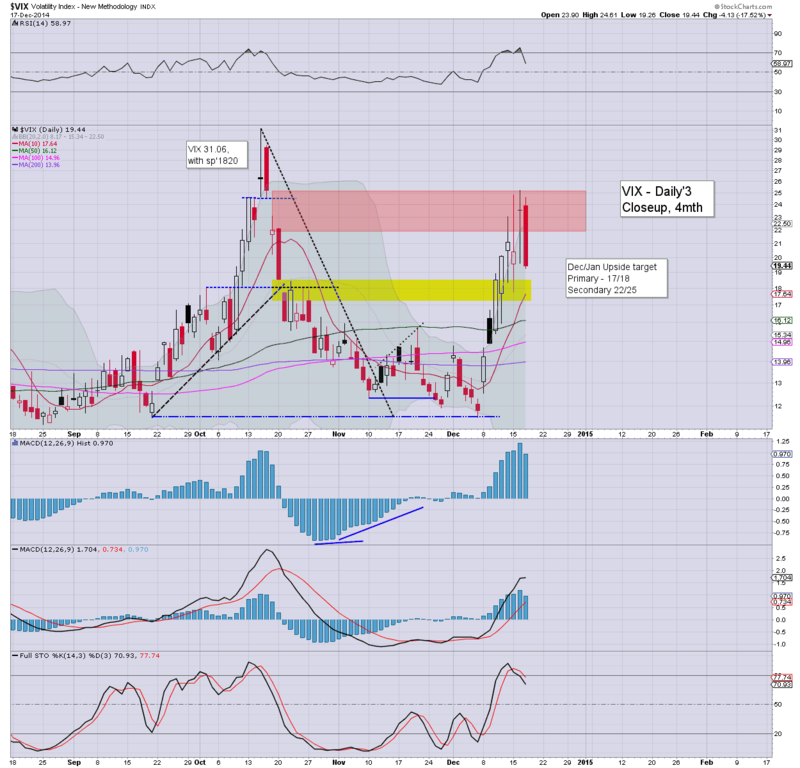 VIX remains cooling -9.6%... set to close in the 21/19 range. regardless... the broader trend/turn is clear... right? The final FOMC announcement is due... with a press conf' from Yellen around 2.15/30pm. US equities look to have secured a key floor of sp'1972... with VIX 23s. 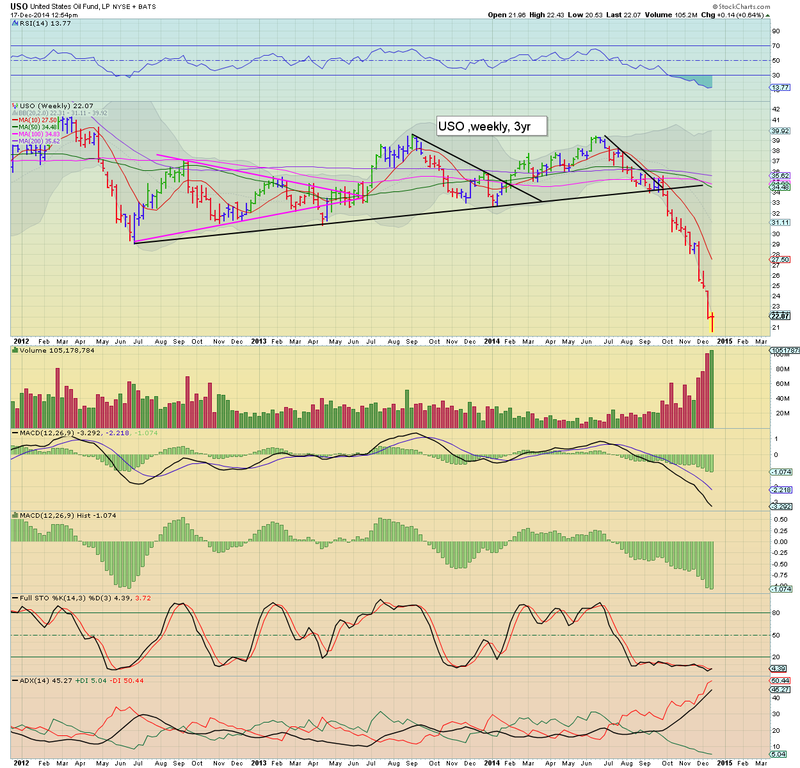 Oil looks similarly to have put in a floor in the $53s... now headed for the low 70s by spring 2015. ... suffice to say... lets get this last Fed press release of the year done with. *golden cross due on the R2K... tomorrow or Friday. The mainstream media will probably get around to noticing that sometime next week. Bulls get an early xmas present with the FOMC keeping the word 'considerable' in the policy statement. 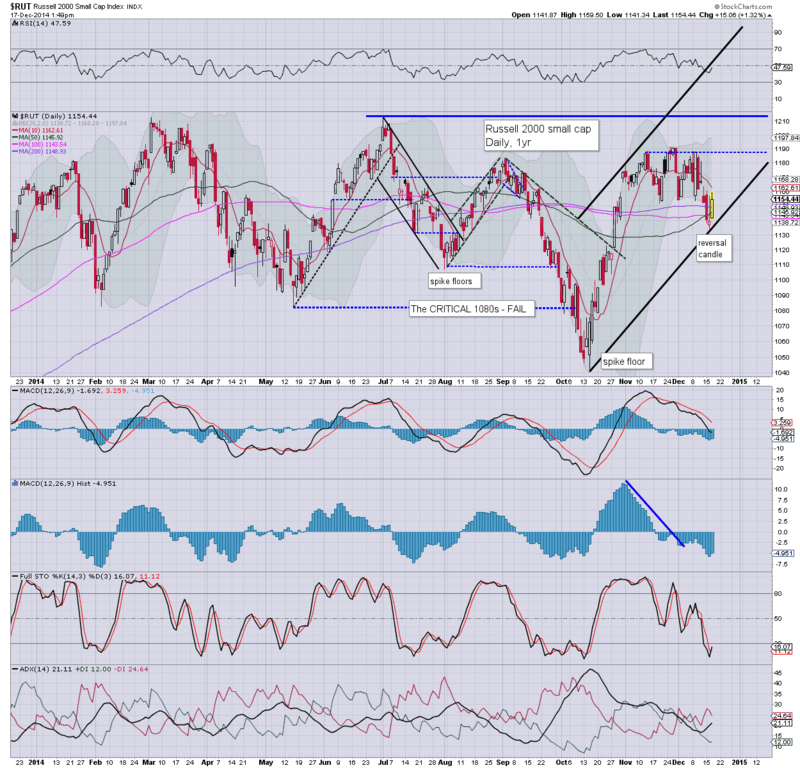 Equities are choppy... but we now look set for a broad run to the 2100s... if not a straight run to 2300s in the spring. 2.28pm... Market looks strong... micro pull backs are ALL being bought, esp' in energy. WIth Oil swinging from the $54s to $59s this morning - the largest % swing since spring 2009, there is a sig' likelihood that Oil has floored.. at least for a few months. 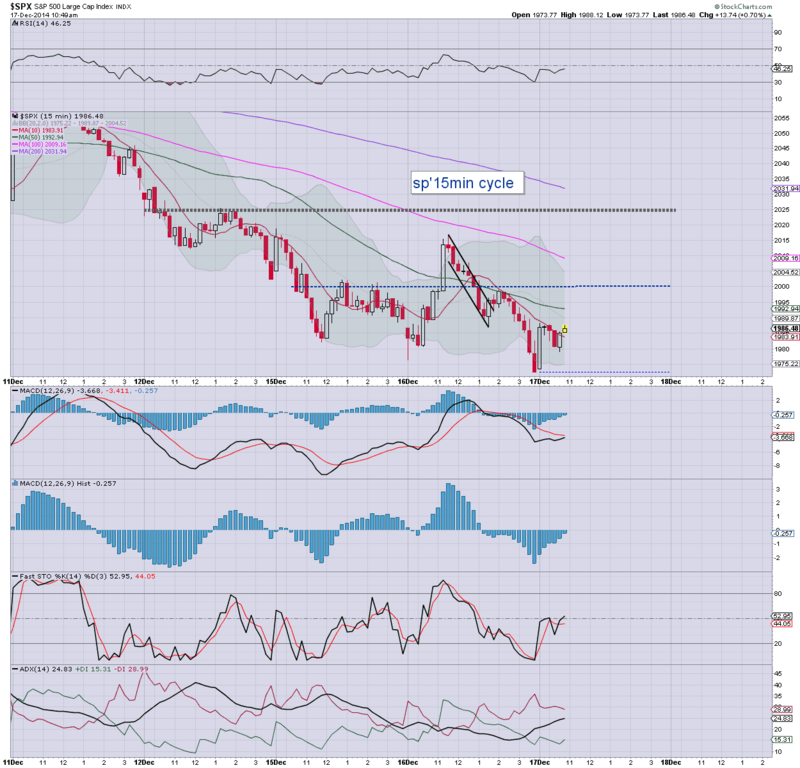 Primary upside 'bounce' target are the low $70s.. which certainly seem viable by next spring. *main market remains choppy, but it holding up relatively well, helped massively by the energy sector. Probably... it'd seem the recent low of $53.60 was a key low. The low 70s look a relatively easy target within 2-3 months. From there, I'd still be looking for renewed downside in second half of 2015. If Oil has floored in the near term.. is bodes especially bullish for ALL world equity markets... esp' the US. back at 2pm.......... for the FOMC. Suffice to say... yes, it remains 'relatively volatile'... but now that we're almost at sp'2000... a 45/50pt downside swing looks too far. 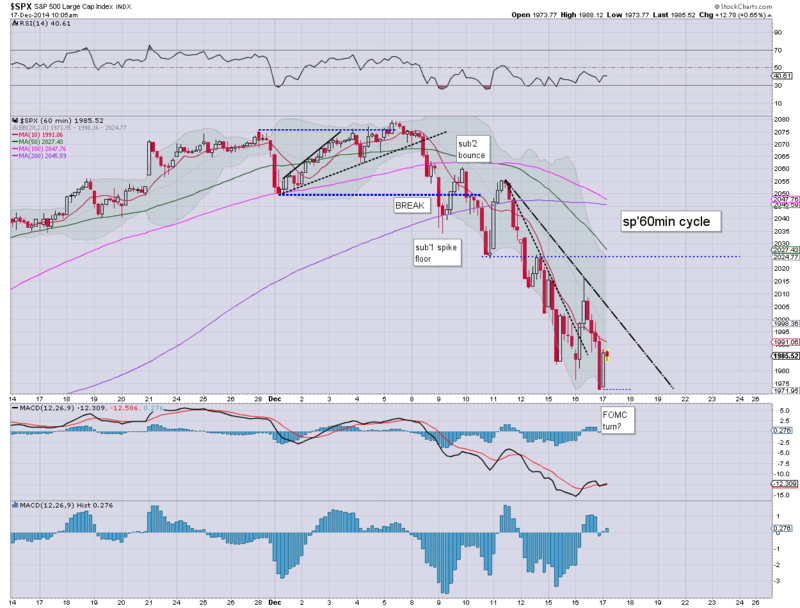 US equities remain moderately higher, but are extremely vulnerable to turning lower into the FOMC announcement of 2pm. A brief hit of sp'1950 is still viable. Metals are choppy, Gold +$2. Oil has turned higher, +0.9%.. and this is really helping the energy stocks... sector ETF (3x lev) ERX +10% in the $54s. So.. we're still higher, but since its a fed day... and with recent strong volatility.. these gains could easily evaporate into the afternoon. Bulls... beware! Spiky top hourly candle.. but still... VIX could easily jump later. Regardless... this remains a tricksy market! US equities open moderately higher, but there is high opportunity for the bears to push lower again... if increasingly unlikely. Oil is low, -0.9%, but well above pre-market levels. Metals have already turned red, Gold -$1. So... opening gains, but its nothing significant, and market is vulnerable to turning red again. Next downside target is sp'1950... but today is surely the last real chance of that being hit. In any case, we should broadly climb after today's FOMC is out of the way. Notable gains, TCK +9%... although I've no idea why... Copper remains broadly weak. 10.15am... ERX +9% in the 53s... energy sector is picking up momentum, but still... until FOMC out of the way, vulnerable to turning back red. 10.22am... typical turn time 11am... market down cycle due... considering the recent price action,... indexes turning red is VERY possible... if not probable. 1950s before 1990s... remain a real threat today. Bulls... beware. US equities are bouncing, sp +8pts, we're set to open at 1980. Metals are similarly climbing, Gold +$5. Oil remains very weak, -2.3% in the $54s. A very pivotal day is likely ahead, one that will likely shape the remainder of the year, and early 2015. So, we're set to open moderately higher, but without question, there is HIGH risk of indexes turning negative at any point this morning/early afternoon. With 1980 failing to hold, there is the obvious 1950 area, where the 200dma lurks, along with the 50% fib retrace of the move from 1820/2079. Even if the market snaps lower at 2pm... with the FOMC announcement... to 1950... there is EXTREME risk of reversal... with a net daily gain. Indeed, in many ways, equity bulls should be seeking a clear spike-floor today.... clarifying a turn... with renewed upside into end year/January. Airlines, DAL/UAL +1.7% or so.. as Oil continues the slide. 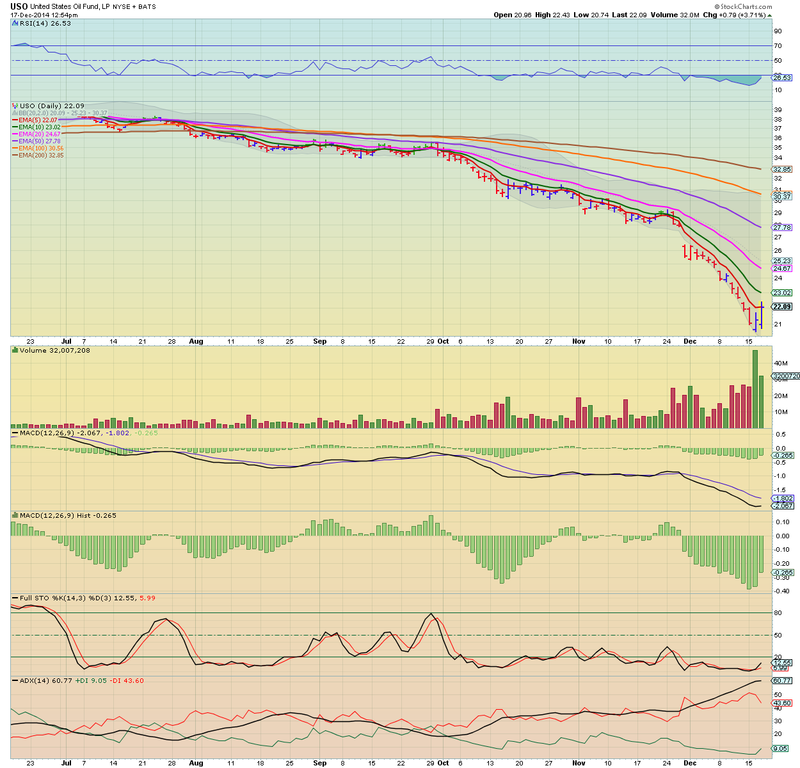 SDRL +2%, although there is no clear short term floor.... quite yet. If the market closes in the low 1960s today... there is the probability of a bearish MACD cross on the giant monthly cycles. That would be a real problem for those in bull land. However we saw the same thing occur in mid October, and we remember how that turned out... right? The US and most world capital markets are seeing some significant action in recent days. 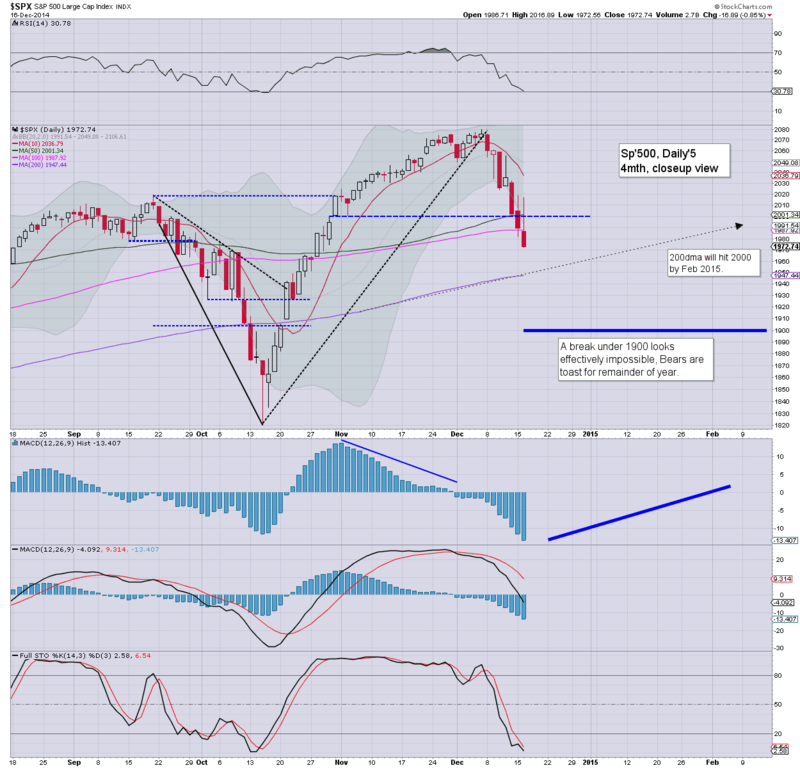 Yet... a retrace of the hyper-ramp of sp'1820-2079 was naturally due. We now have a decline of 107pts (-5.3%), and with the FOMC tomorrow, a key turn is likely. Bears beware... the Yellen is on her way! To begin, I want to say... 'hello deflationland... I never thought sp'1950 was at all viable... it'd seem you were right this time!'. With the daily close <1980.... it would be very natural for Mr Market to wash out one final wave of equity bulls... with a brief move to 1950 tomorrow - where the 200dma is lurking, along with the 50% fib retrace of the 1820/2079 wave. Equity bears should - on any 'reasonable outlook', be looking to get out ahead of the Yellen press conf. There is viable chance the market will briefly spike lower at 2pm.. only to whipsaw at 2.05/15pm... which is something I've seen so many times across the last few years. Wed' will see CPI and Current acc' data. The big event of course will be the FOMC announcement, due @ 2pm. Market is expecting a mere 'wording change' with 'extended/considerable' removed, in relation to interest rates. Fed chair Yellen will host a press conf. around 2.15/30pm, and that will likely last an hour. With the loss of the 800 level yesterday, it was another dire day for the Russian market, with a net daily decline of -13.2%. Next key support is around 550, and it is notable that we did hit an intra low of 578. I do not expect the 400/300s.. as some are beginning to suggest. Oil is due for a $15/20 bounce (to the low $70s), and that will no doubt give the Russian market a massive kick higher in early 2015.. along with most other world markets. Tomorrow will almost certainly be the last major trading day of the year. It has been another crazy year, much of it.. very annoying to those with a bearish inclination. No doubt, the Yellen will do her best to placate the market tomorrow, and on balance, I still believe most indexes will close this week net higher (>sp'2002). The sp'2100s do look a given... it is surely just a case of whether it occurs before year end (if somewhat unlikely)... or in January. US equities saw some significant swings across the day, sp -16pts @ 1972 (intra high 2016). The two leaders - Trans/R2K, settled -1.3% and -0.1% respectively. Outlook is for a key turn at the Wednesday FOMC, with broad renewed upside into year end... and beyond. Today sure was pretty wild. Opening moderate declines to 1976.. then a straight up ramp of 2% to 2016. 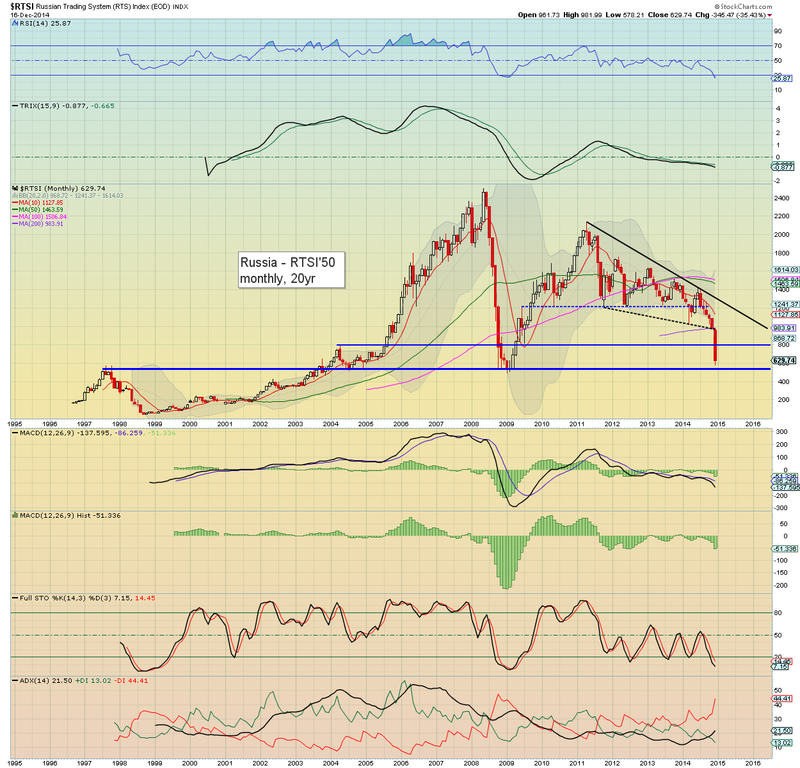 Only to then fully reverse, with a -2.2% afternoon slump.. to a new cycle low of 1972. 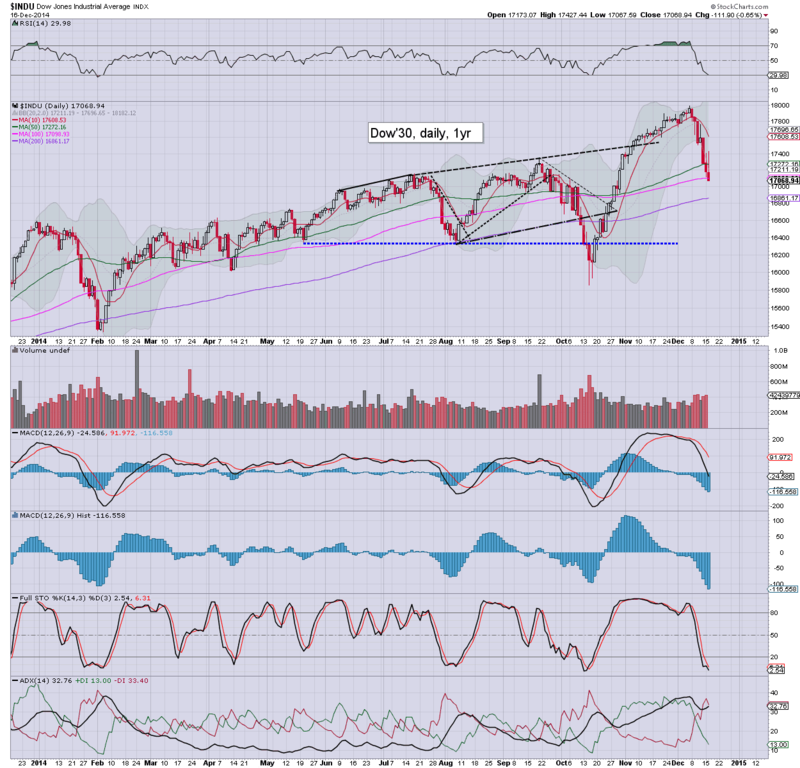 The market has now declined by 107pts (5.3%) since the recent high of sp'2079. As has been expected since last week... a key turn is due around this Wednesday's FOMC. The only issue is whether the market will briefly make a hit of the 1950 zone.. where the 200dma is lurking.. along with the 50% retrace of the 1820-2079 hyper-ramp. Considering the closing hour weakness... a 'brief' hit of 1950 now seems likely.. whether in the morning, or shortly after the announcement at 2pm. *Despite what the maniacs on Zerohedge are touting, I don't believe the world is coming to an end because of the ongoing currency/market crisis in Russia. 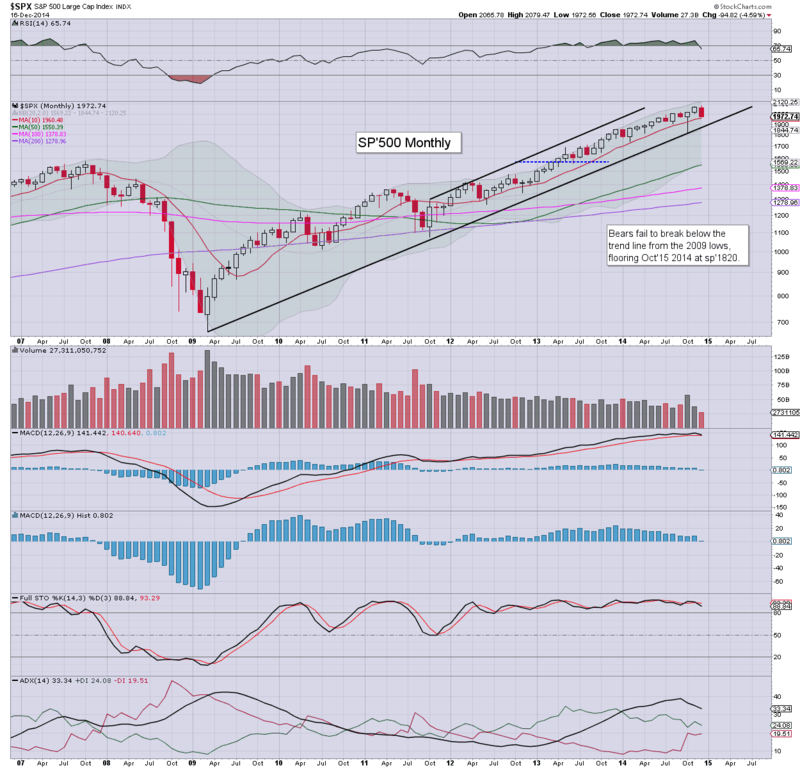 The sp'2100s still look due early next year.